A few people have asked me to do an updated post on High-Intensity Training. For the most part, I don’t have any new insights. I think I’ve said all I have to say on the topic. In this post, I’m going to cover the elements of HIT that I still use and those that I don’t. From the beginning, I have rejected tracking my workouts. I go into detail on why I don’t measure my workouts in these posts. In the fitness blogosphere, we get wrapped up in the mechanic view of weight lifting. How many reps, sets, speed, rest, and on and on. What I’ve discovered is room temperature is the number that impacts my training the most and it is a number I can not control at my gym. More on this point later. I’m not advising others to follow my lead. Numbers can be motivating for many. If I had a trainer, I would insist they record everything, but only share data with me after the workout. I want to focus on form not numbers when I am exercising. You will make the most gains in your exercise program by vastly reducing or eliminating injury risk. HIT selects movements that are non-technical and are performed at a controlled pace. The exercises are purposely inefficient. I cover the mindset change that happens when one adopts HIT in the post Muscle on Weight or Weight on Muscle? The weight is strictly a tool used to trigger a biological process efficiently and with minimal risk of injury. The work is not moving the weight around. The work is what the weight is doing to the muscle. This means the rep speed is purposely inefficient. We aren’t trying to do more work, we are trying to get the weight to do more work. To this day, I never engage in the non-safe exercises that I did before discovering HIT. If I do a free-weight movement, I know to lower the weight as I’ll be moving the weight slower. If I fatigue mid-rep, I know I can increase the speed (introduce momentum) to end the rep. And I only select free weight exercises that I can terminate safely: goblet squat, trap-bar deadlift, dumbbell bench press, and curls. Here comes the shocking part. The intensity I hit today is much less than when I first got excited about HIT. I still believe in using high intensity, but I have a few reasons why I’ve backed off. These are my reasons and will not apply to most people. There is a lot of evidence that ectomorphs respond better to higher volume. Going to failure is still a good strategy, but it may not be the best for us. I like going to the gym. I like the lights. I like the big area where I can stretch. If I were going to failure like I was in 2011-2012, I’d only be at the gym once a week. I prefer 2-3 visits. As Rob stated, HIT can be too efficient. This is great for the person that wants to spend as few minutes per week in the gym as possible, but not for people like me that love going to the gym. My primary reason is that regular gyms are too hot and I easily get exertion headaches. HIT gyms correctly set their temperature about 8-10 degrees F colder than commercial gyms. This allows for much greater intensity. To avoid headaches, I cut back on intensity and increased volume. In the past few years, my rate of recovery has gotten worse. At first, I thought it was just due to my knee injury, but now I think it is more. It is something that I am investigating. If you have a post-workout recovery hack, leave it in the comments. There you have it. This is how I approach HIT today. If my time became scarce, I’d happily hire a HIT trainer in a HIT gym. But for right now, I am still using safe exercises at a reduced tempo, just not to failure, except on a rare day. I have followed a somewhat similar trajectory. 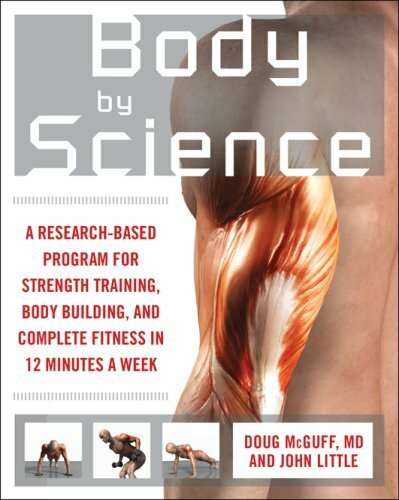 Seven years ago I used the Body by Science book to begin a HIT workout routine. Then switched over to “Max Pyramid” style (static holds with yielding eccentrics, ending in isometric contractions) and did that exclusively for years. One set with just 3 exercises each time: pull, push, hip-belt squat. Intense and short. Tough and draining. But 2 years ago I added a Not-To-Failure routine using the same Big 5 as BBS. Plenty of rest between sets to avoid going to failure. 2 full sets, all 5 movements, 3 sets of reps within each. About 63% of the weight I use in HIT. I consider this a “medium” routine. I alternated between the HIT and this Not-To-Failure routines. Then this summer I added a high-volume low weight routine of the same exercises, about 33% of the HIT weight. 5 full sets of 30 reps each. This is getting closer to a “weighted cardio” approach. So I now have HIT, medium (MED) and light weight (LOW) routines. I do all 3 of them within a 5 day period, then take a break for another 5 days or so. I mix them up for variety, so may do HIT MED LOW over one span of time, or MED HIT LOW another, etc. It’s like doing a 200 meter dash, a 10K run, and a half-marathon. In any case this gives plenty of time to recover from the intense HIT sessions. For HIT, I need to compose myself beforehand, psyche myself into the “HIT mindset”. Even do some bodyweight calisthenics beforehand to loosen up. It’s hard for me to do that exclusively. For the LOW routine, no need for “psyching” or warm-ups, the very first set is the warm up, but by the end I’m huffing and puffing and approaching exhaustion. The MED routine is not as intense as the HIT, not as long as the LOW. So it’s a nice mix-up that keeps my interest. @Garymar – I like your program a lot. It sounds like a good way to think about a modified HIT. I was wondering, if you don’t go to complete MMF and you use a somewhat higher volume than most HIT practitioners do, that’s what you said, do you mean that you’re using more than one set per exercise? Also, can I ask you what you current routine is? Which exercises are you actually performing? By the way, what do you think of my routine? @Maigret – Yes, I am now doing more than 1 set (usually 2, sometimes 3). I don’t have a routine. Depending upon what equipment is available, how I’m feeling, how hot the gym is and novelty, I pick different exercises. I still use the principles of tension and safety. I’m not a trainer, so I can’t comment on your routine, other than to say if it inspires you and it is safe, then it is a good plan.